I love Christmas. (Especially now that I can just Amazon presents right to my doorstep.) I love our traditions, viagra and how we have merged old ones with new ones. How my Cuban family has introduced my husband’s Midwestern family to roast pork, discount rx black beans and yucca. How instead of leftover Pan con Lechón (pork sandwiches) on Christmas day, we have beef tenderloin and potatoes and caesar salad. And red velvet cake, and cookies, and more cookies. But most of all, I love when the dishes are all done and everyone is full of food, we all sit around the table and sip something good. It’s usually port, but on Christmas we celebrate with something a little more special – Crema de Vie. Crema de Vie is simply Cuban Eggnog. But unlike the weird yellow stuff you buy at the grocery store, it’s thick, super-sweet and reminds me of stealing clandestine sips when I was a little girl. A perfect end to a holiday meal. It starts with a simple syrup infused with lemon peel, a cinnamon stick and a vanilla bean. 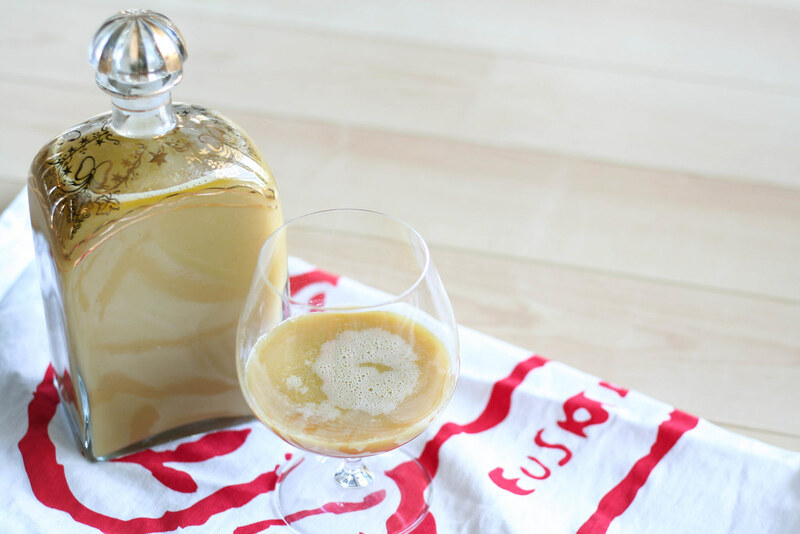 Once cool, it’s blended with egg yolk, condensed milk, vanilla extract and (of course) rum. It’s strained a couple of times to make it silky smooth and then chilled. It has subtle caramel and vanilla flavors that couple perfectly with the warming rum. One of my favorite Christmas traditions. Make a simple syrup by placing the sugar, water, lemon peel, cinnamon stick and vanilla bean in a pot. Bring to a simmer over medium-high heat. Let bubble for about a minute, stirring constantly to avoid boiling over, then remove from heat. Let cool completely. Once the syrup is cool, pour the contents into a large bowl or pitcher through a fine-mesh sieve. Whisk the egg yolks and pour through a clean fine-mesh sieve. Add the strained egg yolks, condensed milk, vanilla and rum to the simple syrup and whisk thoroughly. Pass through a clean fine-mesh sieve twice more, then refrigerate and enjoy. Keeps about 2 weeks in the fridge in a sealed container. Make 3 1/2 cups, or enough for 12 servings. I am so glad you are back. I look forward to more of your recipes. My sister has made your bacon wrapped turkey breast for Thanksgiving the last two years. This year she made a sweet (cranberries, figs, pecans) and a savory (goat cheese, spinach and rosemary). They were so good. Just brined and baked turkey seems a bit tame compared to these. Since most everyone likes white meat, there is no waste and they slice up wonderfully for sandwiches. Thank you so much for sharing your recipe.